The head of the legendary Stabil family just got stronger. A new Band-of-Power runs from heel to forefoot for lock down support. Updated heel lining slips the foot in, then keeps it from slipping out. SPRINTWEB supportive, lightweight TPU base layer and abrasion-resistant RPU top layer for excellent stability and protection. Ringcore: highly responsive 2nd density EVA core provides power and speed during multidirectional moves. Motion Guiding System: provides excellent cushion, stability and guidance for strong and powerful moves. miCoach ready! Upper: ADITUFF sport-specifically positioned, highly abrasion-and tear- resistant upper material. Band-of-Power: combination of a power frame and a powerband on top to provide superb fit and stability. Midsole: ADIPRENE shock-absorbing soft EVA provides excellent cushioning and helps reduce impact to ankle joints and knees. TORSION SYSTEM provides best mIdfoot integrity and motion guidance. 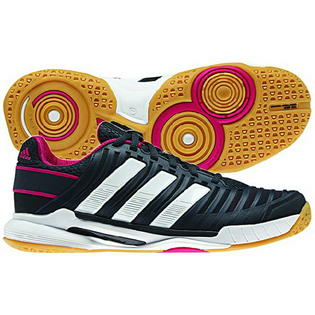 Outsole: Top Grip Rubber: Non marking rubber compound for ideal grip on all indoor surfaces.